Through its online digital collections, the Harry Ransom Center is able to share highlights from some of its holdings. To date, the site contains more than 43,000 items and continues to grow as newly digitized collection materials are added on a regular basis. The most recent addition is a sampling of materials from the archive, acquired in 2014, of Colombian writer and journalist Gabriel García Márquez, now open for research in the Ransom Center’s Reading and Viewing Room. In addition to visiting the Ransom Center in person, anyone may access an online selection of digitized items from the García Márquez archive. Selections include a letter from García Márquez to author Salman Rushdie, his corrected draft typescript of the epilogue to Chronicle of a Death Foretold, typed note cards relating to The General in His Labyrinth, and an audio recording of García Márquez’s acceptance speech for the Nobel Prize in Literature in 1982. 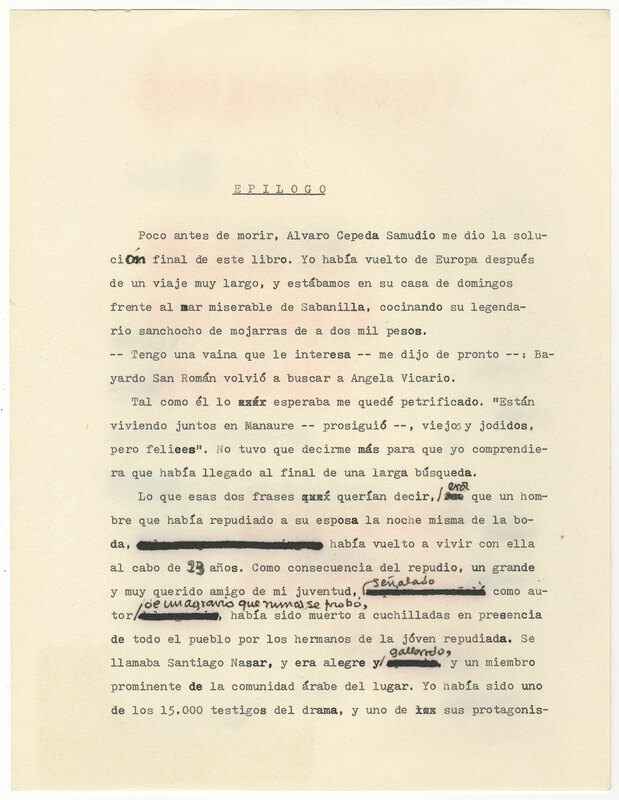 Gabriel García Márquez’s corrected draft typescript of the epilogue to “Crónica de una muerte anunciada” [“Chronicle of a Death Foretold”], 1980. / Borrador mecanografiado y con correcciones de Gabriel García Márquez del epílogo de “Crónica de una muerte anunciada,” 1980. The García Márquez archive includes original manuscript material, predominantly in Spanish, for 10 books; more than 2,000 pieces of correspondence; drafts of his 1982 Nobel Prize acceptance speech; more than 40 photograph albums documenting all aspects of his life over nearly nine decades; the Smith Corona typewriters and computers on which he wrote some of the twentieth century’s most beloved works; and scrapbooks meticulously documenting his career via news clippings from Latin America and around the world. The Ransom Center is actively working to increase the amount of García Márquez archive items available in the digitized collection. The digital collections portal provides access to the Ransom Center’s holdings for students, scholars, and members of the public who are unable to visit the Center. It also provides a way for visitors to access fragile materials or collections that exist in challenging formats.